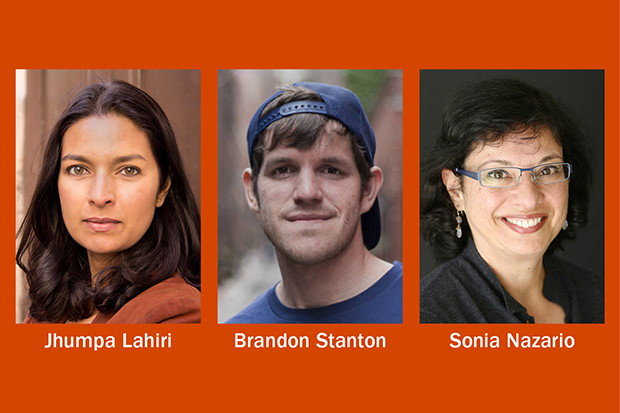 The 16th season of the University Lectures will continue in the spring semester with two Pulitzer Prize-winning writers—Jhumpa Lahiri (“Interpreter of Maladies”) and Sonia Nazario (“Enrique’s Journey”)—and the creator of the immensely popular Facebook/Instagram sensation Humans of New York, Brandon Stanton. Syracuse University’s premier speaker series brings to campus notable individuals of exceptional accomplishment who share their diverse global experiences and perspectives. The series was created through, and is supported by, the generosity of alumnus Robert B. Menschel ’51. The University Lectures are open to all. The presentations by Lahiri (Tuesday, Feb. 7, 7:30 p.m.) and Nazario (Wednesday, April 5, 7:30 p.m.) are both free and will be held in Hendricks Chapel. Stanton’s lecture (Monday, March 6, 7:30 p.m.)—cosponsored by University Union—will take place in the Schine Student Center’s Goldstein Auditorium; this will be a ticketed event, with tickets going on sale in February; details will be announced at the beginning of the spring semester. Lahiri was awarded a Pulitzer Prize in 2000 for “Interpreter of Maladies” (Houghton Mifflin, 1999), her debut story collection exploring issues of love and identity among immigrants and cultural transplants. She delved further into the immigrant experience with “The Namesake” (Houghton Mifflin, 2003), which was made into a Fox Searchlight feature film in 2007. Her book of short stories, “Unaccustomed Earth” (Alfred A. Knopf, 2008), won the Frank O’Connor International Short Story Award (the world’s largest prize for a short story collection) and was a finalist for the Story Prize. Lahiri’s “The Lowland” (Alfred A. Knopf/Random House, 2013) won the DSC Prize for South Asian Literature and was a finalist for the Man Booker Prize and the National Book Award for Fiction. Her most recent work, “In Other Words” (Alfred A. Knopf, 2016), explores the often emotionally fraught links between identity and language. Her appearance is sponsored in cooperation with the College of Arts and Sciences and the Humanities Center. With more than 22.5 million followers on Facebook and Instagram, it’s no surprise that Stanton has been called an Internet phenomenon. In late 2010, he started the photography blog Humans of New York with the goal of photographing 10,000 New Yorkers and plotting their photos on a map. When he started incorporating short stories with his photos, Stanton soon found he had created something much bigger. In 2013, Stanton wrote a companion book, “Humans of New York” (St. Martin’s Press), that spent 45 weeks on The New York Times Bestsellers List. In 2015, he followed up with “Humans of New York: Stories” (St. Martin’s Press). In early 2015, Stanton’s post about a boy from an underprivileged Brooklyn middle school in a crime-plagued neighborhood led him to initiate an online crowdfunding campaign to raise $100,000 to send the school’s students on field trips to Harvard to expand their idea of their potential. HONY’s followers raised more than $1 million for Mott Hall Bridges Academy, and the inspirational story garnered international media attention and earned Stanton a meeting with President Obama. Stanton’s appearance is sponsored in cooperation with University Union. Nazario is an award-winning journalist, author and prominent advocate/activist who has drawn widespread attention to such critical social issues as immigration, racial discrimination, hunger and drug addiction, as well as U.S. foreign policy. A reporter for more than 20 years, she is best known for “Enrique’s Journey,” her series of reports for the Los Angeles Times following a Honduran boy’s struggle to find his mother in the United States. It earned the 2003 Pulitzer Prize in Feature Writing and the George Polk Award for International Reporting. In book form, it later became a national bestseller. Nazario’s coverage for The New York Times of the detention of unaccompanied immigrant children at the Honduran border in 2014 garnered global attention and led to her addressing the U.S. Senate Committee on Foreign Relations. She has served on many boards, including the board of Kids In Need of Defense, a nonprofit launched by Microsoft and Angelina Jolie to provide pro bono attorneys to unaccompanied immigrant children. American Sign Language (ASL) interpretation and Communication Access Realtime Translation (CART) are available at all lectures. For questions about accessibility or to request accommodations, contact the Equal Opportunity, Inclusion and Resolution Services (EOIRS) office at 315.443.4018. For up-to-date information on the series, visit the University Lectures website, follow on Facebook, and join the University Lectures email list.